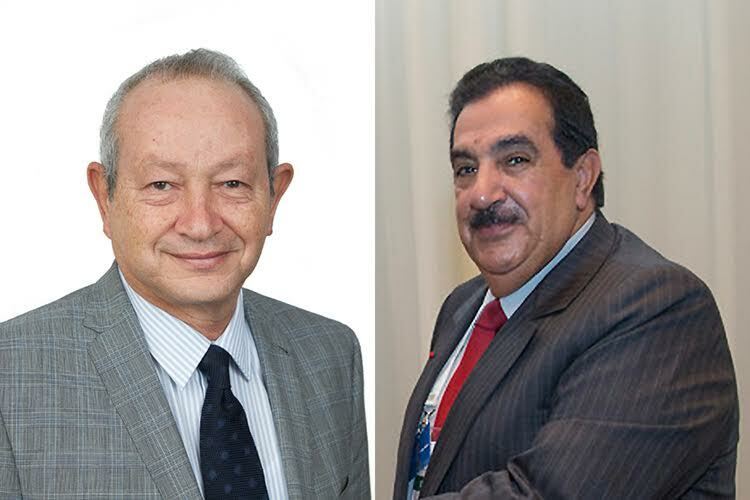 Cairo: Two new members have joined the Board of Trustees of The American University in Cairo (AUC): Naguib Sawiris, chairman of Orascom TMT Investments, and Ambassador Hamza B. AlKholi, chairman and CEO of the Alkholi Group in Saudi Arabia. A prominent businessman and investor, Naguib Sawiris holds a master’s in technical administration and Diploma of Mechanical Engineering from the Swiss Federal Institute of Technology in Zurich. Since he became part of the family business Orascom in 1979, Sawiris led its expansion to become one of Egypt’s most diversified and successful conglomerates, establishing its railway, information technology and telecommunications sectors. His company, Orascom Telecom Holding, became the world’s sixth largest mobile telecommunications provider in 2011 after merging with VimpelCom Ltd. He disposed of his interest in Vimpelcom, and kept some of his telecom operations under the name Orascom Telecom Media and Technology (OTMT), the company he then went on to expand into an Investment Holding, with interests in financial services, energy and agri-industries, among other sectors. He served as CEO of OTMT for some time, stepping down in December 2016. Sawiris has been recognized internationally, receiving honorary degrees, industry awards and civic honors, such as the Legion d’Honneur of France, Honor of Commander of the Order of the Stella della Solidarieta Italiana in Italy and Sitara-e-Quaid-e-Azam award in Pakistan. He currently serves as the CEO and deputy chairman of Nile City Investments, chairman of Gemini Development and board chairman of EuroNews. In addition, he acts as non-executive director of Endeavour Mining Corporation, Commercial International Bank of Egypt and Beltone Financial Holding. Serving on numerous international and local boards, committees and councils, Sawiris served as a member of the International Advisory Committee to the New York Stock Exchange and the International Advisory Board to the National Bank of Kuwait. He is currently a member of the London Stock Exchange Group’s Africa Advisory Board, Board of Trustees of Nile University and the French University in Egypt, board of the Egyptian Counsel for Foreign Affairs, Consumer Rights Protection Association, Cancer Society of Egypt and the Arab Thought Foundation. Hamza AlKholi studied pharmacy at King Saud University. His company, the AlKholi Group, currently oversees numerous subsidiaries in various industries, including aviation, hotels and resorts, real estate development, chemicals, oil and gas, pharmaceuticals, medical equipment, fertilizers, banking, construction, contracting, management and operations maintenance, information services and technology, and telecommunications. AlKholi has named the Dr. Hamza AlKholi Information Center at AUC, a single-stop resource for prospective students and parents. He has also made various contributions in the region, particularly Saudi Arabia, including the establishment of the Dr. Hamza Alkholi Chair for Development of Medical Education at the Al Imam Ibn Saud Islamic University in Saudi Arabia and the Prince Salman Center for Disability Research. In recognition of AlKholi’s achievements, the government of Grenada appointed him as Ambassador Extraordinary and Plenipotentiary, and the Republic of France gave him the accolade of Chevalier de la Legion d’Honneur as well as the rank of Officier de la Legion d’Honneur. AlKholi has served as permanent delegate of Grenada to the United Nations Educational, Scientific and Cultural Organization. He is also a founding member of various organizations, including the Arab Business Council, U.S./ Middle East Project and the Arab Thought Foundation. He was also a member of the founding team of the World Economic Forum. Among the international organizations of which he is a member are the Clinton Global Initiative, International Crisis Group, Foreign Policy Association and the End Human Trafficking Now advisory board.